Having heard about the National Folk Festival over the years, I flew direct Wgn-Canberra just prior to Easter and found myself camping with some Aussie friends in a huge sea of campervans, trailers and tents. 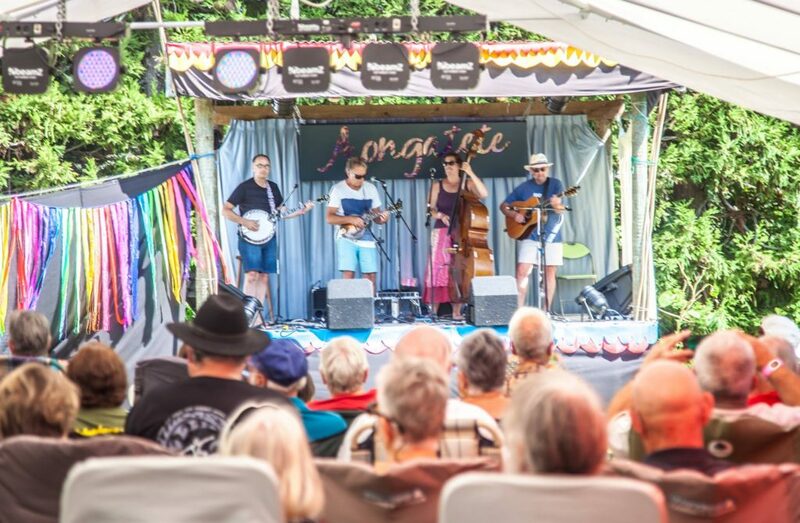 This festival has been going 51 years and many of the attendees are musicians who have known each other for years through diverse folk clubs and festivals. It was amazing to see the scope of the festival, with 18 music venues, DIY art spaces, food and market stalls, kids zone, circus lessons and Fringeworld. There were overseas acts, indigenous singers, younger folk/rockers (loopers/celtic/twin sisters), bands incorporating country/blues/world/ acoustic, traddies, and my favourites Spooky Mens Chorale and Fred Smith (a diplomat/songwriter/author). There was a huge emphasis on celtic bands and the Irish Daoriri Farrell Trio and Aoife Scott Band were two to get the crowds up and dancing. A band called 19-Twenty were incredibly lively and loud, and each show was packed out and went late into the night. There were bars in most large marquees and one was under the concrete stands of the Racetrack, coincidentally the warmest venue on the cold Canberra nights. One huge concrete room was filled with 10 or 12 jamming celtic sessions all pumping sound, with fiddles, whistles, bodhrans, etc. Above this was the home of the trad singing sessions which were scheduled mostly during the day. There was so much to do and rather than walk back 1/2 km to the campground, I found wonderful food on site. Even the fresh cooked damper with golden syrup was a yummy delight! Several blackboards were running all day, and I enjoyed a quiet drink and songs whenever I needed a rest. 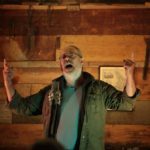 The 5 days of festival were the biggest and best I’ve been to, and if the AU $400 cost seems high, there are volunteer options as well. 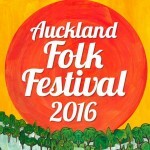 Check out National Folk Festival 2017 on facebook or on their website – it was simply amazing!! 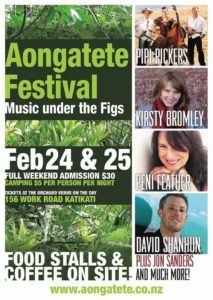 Moira and Denyse travelled up to Aongatete just south of Katikati for the Festival Feb 24-26. Chris and Barbara also travelled up from Levin and we enjoyed hanging out with them on Saturday. Had a lovely fine weekend camping under the canopy of the figs and kiwifruit. The blackboard menu performers were a treat on the Friday night. Drifted off to sleep listening to the jammers in the background. Through the night I could hear the cool echoing call of a morepork. The cicadas heralded the awakening of a new day! A great lineup on Saturday, old and new favourites, Rhode Workz, Pipi Pickers, David Shanhan, Kirstey Bromley, Rachel Darwick entertained us throughout the day.It was a lot of fun dancing into the evening and even a few of the entertainers joined in. A wonderful weekend away, great comraderie and friendships and as always a soak in the silky smooth mineral waters of the bay was very welcoming and relaxing. 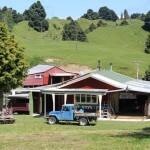 Nestled under the Tararuas near Otaki Forks, the Riverslea Retreat is a perfect venue for a relaxing weekend. The communal lounge is large enough to comfortably fit in at least 35 people and their various assorted instruments. Add to this a large dining room and communal kitchen, a wide selection of bunk rooms, good pressure in the shower and you are hopefully beginning to form a mental picture. The cosy fire that burned all weekend was almost as warm as the welcome received from our wonderful hostess, Anne McGregor, both essential to creating a lovely, ambient and convivial atmosphere. Starting on Friday night, beds bagged and cars unloaded, everyone congregated in the lounge for a sing around. Expertly compered by Jan, the circle kept on going round and round until the small hours as we sang and played, (accompanied of course by a wee dram or two for those who wanted). At one point, I noticed we had a ‘knitting couch” with three knitters in a line (male and female) their needles clacking away as they listened to the music. Saturday was a beautiful day, with the native birds adding their own magic to the music being made inside. Some people went walking, whilst others chatted, played music, read books, played scrabble, knitted or just chilled. Others made good use of the sunny outside deck space to play some traddy tunes! The numbers swelled for Saturday night’s Pot luck dinner (an amazing selection and I would defy anyone not to find more than a plate full to please their taste buds). We were lucky to have Don along, who tinkled away in the background (on the piano of course!) and provided some wonderful lounge music while we were eating and socialising. Then it was more of the same – with everyone having the opportunity to join in the music. The time just flew and all too soon it was time to head off to bed. One of Saturday’s highlights for me was “Game of Thrones” played on Hurdy Gurdy’s, so thanks to Philippa and Dom for that and mustn’t forget Julian’s memorable contribution on the dinner gong! Most people were slow to rise on Sunday morning and while some headed off, others stayed for a leisurely lunch before the clean-up and all too soon, the goodbyes. Riverslea is all about getting together, laughing, having fun, remembering old stories and making new ones, rather than how far you have progressed on your musical journey! As a relative beginner compared with most others, I so appreciate the encouragement everyone gives each other and the inclusive atmosphere means that anyone is welcome to join in. So, there you have it, the very special recipe for Riverslea – so much more than the sum of its ingredients, more a combination of everyone joining together to make it what it is! An amazing weekend of talented musicians from all over the North Island, coming together to jam, perform and learn from each other. 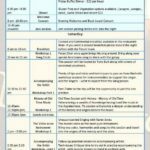 Tony Burt and Karen Jones organise this – well worth going for the weekend activities and the Saturday dinner. 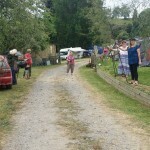 “A yearly gathering of musicians, whanau, friends. 5 days of camping, jamming, eating, swimming and hanging out together”. Hosted by the wonderful Mary Kippenberger and Peter Charlton-Jones in Otane, Hawkes Bay. 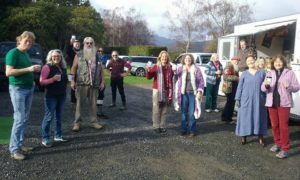 I had an amazing time at Kumeu this year as the new organisers had created new venues, revamped the scheduling and showcased up and coming newcomers, and made sure the all important coffee and food vendors were on the job. Main guests included Martin & Eliza Carthy, Mustered Courage (an amazing Australian bluegrass band), Chris Priestley and Unsung Heroes, banjo player extraordinaire Dan Walsh from England, Albi & The Wolves, Bollands, Gillian Boucher & Bob McNeill and a wonderful introduction to Donna Dean. Many other bands were included and I enjoyed each one that I managed to see. Starting with Roger Giles’ Come All Ye, the Barn hosted many fine individual performances from the wonderful musician/singer attendees, and later featured the Martin Blackman Young Performers Award. I am amazed by Rhode Workz from Hamilton who are unbelievably young but who can thrash out a superb bluegrass performance – they deserve to be seen more around the country. 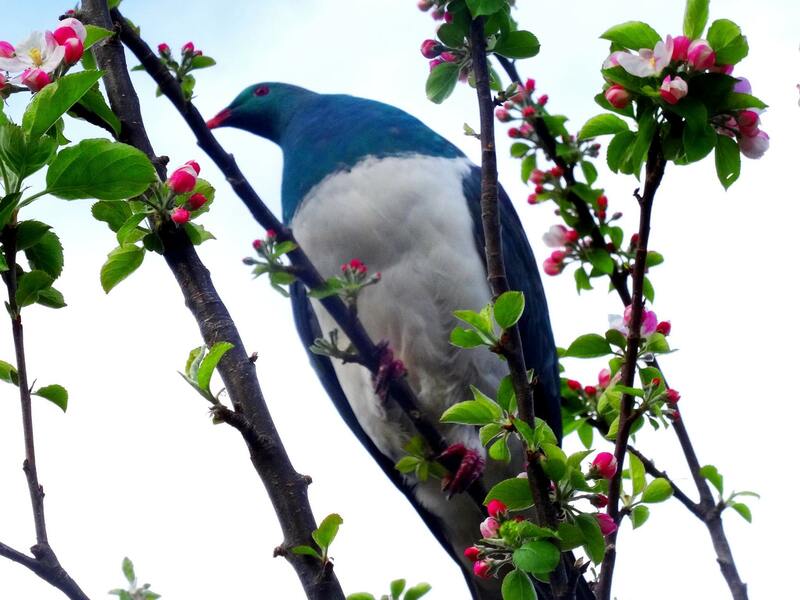 There were halls for dancing, eagerly awaited main marquee performances, workshops popping up in 3-4 places, RMNZ Tui Finalists in Concert with the Tui awarded to Holly Arrowsmith for her album “For the Weary Traveler” and so much more!! The final concert, as always, was a highlight with such high quality guests and the high energy second half had audience members dancing up front. It was a touch emotional as Roger spoke about “stepping back” from the Bunker and the main job of hosting the festival, and a tribute to Marcus Turner by Martha Louise was very affectionately received and sung along with by the very large crowd. Camping amongst 2,000 musicians creates a wonderful atmosphere which I love to be part of. 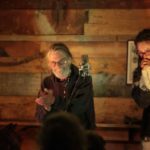 On Sunday night especially, after the exceptional final concert, the bright moon and stars formed a lovely backdrop to pockets of singing, jamming, playing and unexpected treats – a 2:30 a.m. jam by Dan Walsh, Frank Burkitt, with Pascal and Chrissy Jackson on fiddles was a wonderful memory. For a number of years, Anne and I have wanted to go to the Tahora Festival, but it clashed with my work. Well that all changed this year and we finally made it for five great days in Inland Taranaki. Fellow club members Jo and Merlin were also there. The Tahora Festival runs from 27 December to 2 January 2016 and of course the highlight is seeing in the New Years, complete with “real fireworks”. A ninety minute drive from Stratford over the Forgotten World Highway, complete with 4 saddles, saw us at the Festival site and the first impressions were Wow! 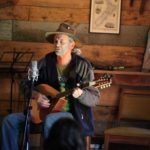 Set on Kerry Turner’s farm at Tahora, the venue has plenty of room for camping, and a very large concert/chill out area in an old woolshed that has been enlarged over the years. Given that the nearest food supplies are at either Stratford or Taumarunui, there is also plenty of fridge/freezer space and even a walk in chiller to keep the beer and food cold for 6 days. As newcomers, also known by some as Tahora Virgins, we camped on the lower level. The middle and upper campsites are usually the preserve of the Tahora regulars, some of whom have been camping here for years. The program is mostly floor spot concerts each night featuring a mix of many familiar artists. The rest of the time is usually just relaxing and jamming with friends. Toward the end of the festival and after noting how there was no blackboard time set aside for newcomers, I approached Kerry and another organiser and suggested a blackboard concert for newcomers. We agreed on a time and I was asked to run it, so I quickly rounded up a posse of performers including Anne and I and Jo Sheffield and Helen Stewart and others and gave an hour’s performance. Other attractions in the area include the Mt Damper Falls just 20 km away, Historic Whangamomona, The Tangarakau Gorge, Joshua Morgan’s grave, [Google him] and the Forgottenworld Adventures Railcarts which travel over the mothballed Stratford Okahukura rail line. The festival is more of a relaxing summer holiday destination for acoustic musicians than a folk festival, in fact there was very little “Folk” music heard at all. It is said that there is time as we know it and Tahora Time! The next Tahora is in two years time so if you want a different and relaxing holiday away from the hordes at the beaches and lakes, then this may be just the ticket. 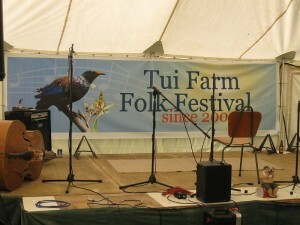 This year my husband, Jeremy and I went to the Tui Farm Folk Festival. Tui Farm is south west of Nelson, near Tapawera. Held annually since 2003, Steve and Carol Rose, the organizers of the festival, were the most wonderful hosts. 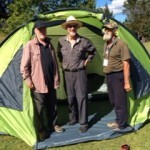 We were greeted by Julian Ward and Dave Croucher, who helped us set up camp. The 4 days programme offered several activities. We attended a wonderful choir conducted by Anna Heinz, who also ran a guitar workshop, and in the late evenings, led jam sessions with her husband Peter. We also took part in a wind workshop, led by Marguerite Clubb, and enjoyed Nina Solter’s yoga laughter workshop. The Blind Dates were a wonderful way of getting people mixing. 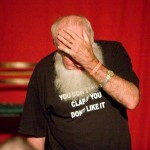 The Poets session, led by Roger Lusby, was a highlight! One special guest was Bob Bickerton who sang and played a variety of flutes, pipes, strings and percussion. Cairde, a group of four women presented Celtic music, with marvelous vocals and harmonies. Bob Bickerton and Evey McAuliffe (“Flying Feet”) ran the ceilidh in the evening, with great calling of dances, and music too. There were concerts, blackboards for newcomers and for under 16’s, Tui Spots and kid’s activities. The talent that presented itself was amazing! 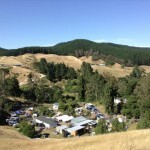 Our words to describe the Tui Farm Folk Festival are: friendly, well organized, inclusive and engaging. Many thanks to Richard and Ruth, Julian and Diana for encouraging us to go. We hope to go next year! 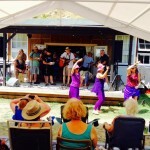 Great music, great fellowship and an added bonus – great weather. When we arrived on Friday afternoon it was just beginning to rain. By the time we had wiggled our caravan into the too small parking space and set up our awning we were drenched and spirits were dampened. What a difference a day makes! We woke on Saturday morning to brilliant sunshine which lasted for the whole weekend. The programme was full – almost too full. 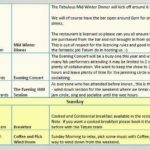 Four performance venues offering music concurrently so we had to make difficult choices about who we wanted to see and often hopped from one venue to another mid session to be able to catch the acts. It is hard to choose a standout performance – Kim and Dusty were as good as ever (perhaps even better in the festival buzz), our Jo Sheffield with her friend Helen Stewart put on a great performance in the Balladeer tent as did many others. My personal favourites in the main Marquee were Gillian Boucher and Bob McNeill, and in complete contrast to them, The Pipi Pickers. We are lucky to have Gillian coming to play for us at LFMC in 2016 and I feel a road trip coming on to go north as the Pipi Pickers host the Leigh Folk Music Club. The fabulous family atmosphere meant there were people of all ages enjoying the music, the sunshine and the friendly vibe. We caught up with old friends and made a few new ones so all in all – a very enjoyable weekend. Congratulations to everyone who had anything to do with the organisation of the festival. It goes from strength to strength! 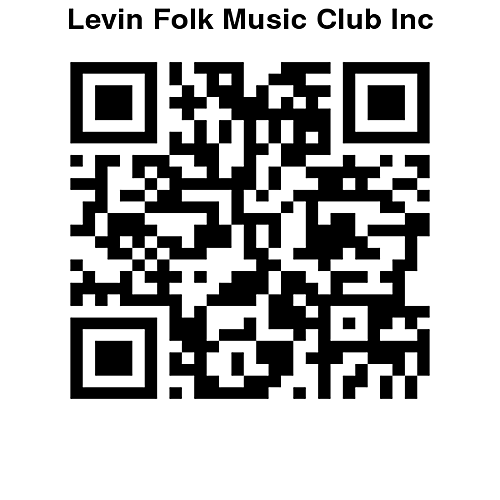 Last month I enjoyed a musical treat further afield from Levin that I’d like to share. 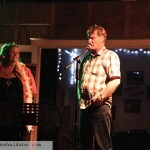 First Fridays at Rumpy is an open mic night at Mary Kippenberger and Peter Charlton-Jones’ farm in Otane. Mary and Peter have run Te Rangi Festival for 14 or so years on their property but now have branched into monthly open mics, joined by the local musos, for koha. Rumpy is their purpose built venue with stage, cafe tables and kitchen and has been decorated with a lovely ambience. Son Matt offers pre-made cafe food at very reasonable prices with dinner commencing around 6 pm, then music begins around 7:30 pm. If you have driven over, there is room to set up tents and showers and toilets are available if you ask Mary first. August was the celebration of Rumpy’s second birthday and was a fantastic evening of exceptionally good music. Katie and Danny were home from Australia and joined Cabin Fevre with the fastest bluegrass tunes ever; Tony Burt compered the evening and added lovely dobro accompaniment; Wai Tai were beautiful with strong Maori and spiritual songs, and Erin and Frank gave us a great bluesy set. The atmosphere in the packed room was joyous and enthusiastic, and Mary was in her element, hostessing and sharing in the musical fellowship. It was a thoroughly enjoyable night of music – try and catch this when travelling to Hawkes Bay.